My husband’s coworker was sweet enough to send him home last week with beautiful summer squash from her neighbor’s garden. When decided what to make for our big weekend dinner I knew I wanted the squash to be the star so I decided on this risotto. 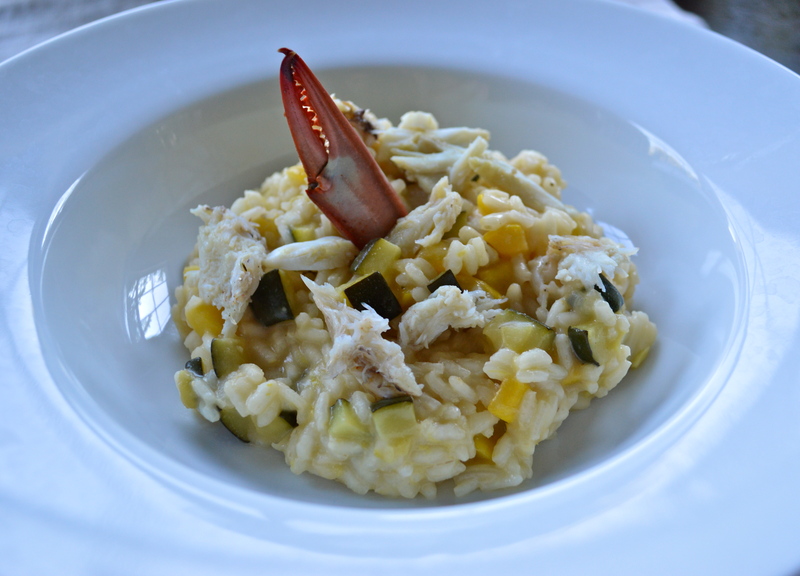 The sauteed squash and the brightness of the lemon pair perfectly with the creamy risotto and the big chunks of Maryland Blue Crab are just the icing on the proverbial cake! 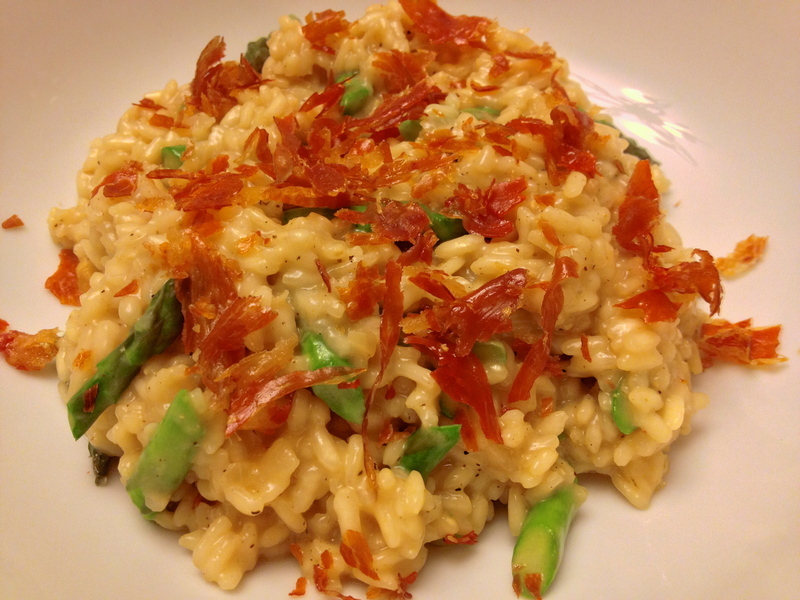 I thought it was a really fun version of your basic risotto and I’ll link to the other ones we’ve made at the end of the post in case you need even more inspiration! 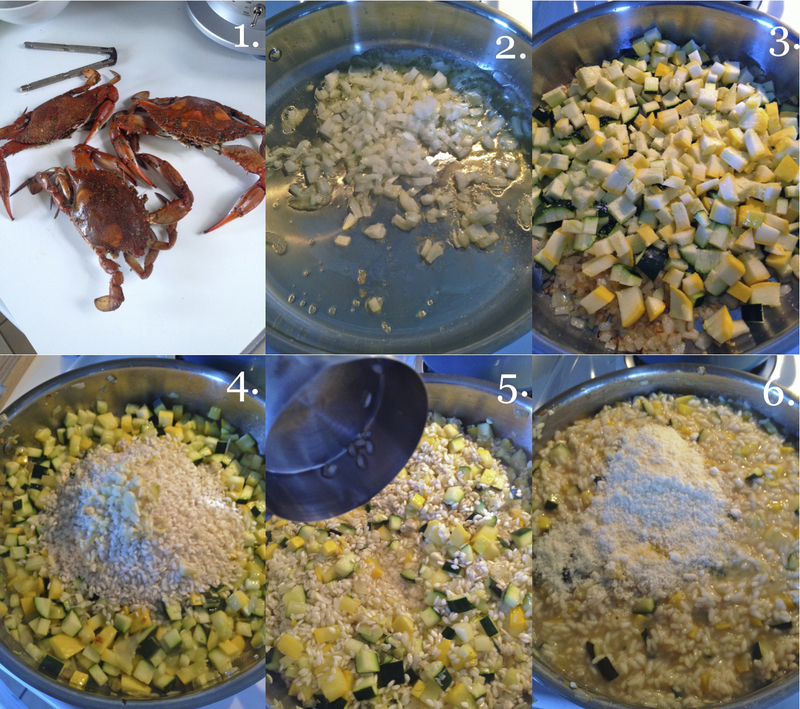 This recipe is a great way to use up your squash and if you can get pre-cooked crabs (like we did), then you can be eating this in no time! Start of by cracking your crabs and getting the meat out (1). We used three maryland blue crabs that our grocery store had pre-cooked, if you can’t find pre-cooked, HERE is a really great video on how to cook them yourself. Simmer 7-8 cups of vegetable stock in a pot and keep it near the burner you’ll be making your risotto on (you probably won’t need all of the stock but you always want to have more ready than you’ll need!). Heat up 2 tbsp olive oil over medium heat then add 1/2 cup diced white onion (2). Sauté for about 5 minutes until the onions are translucent then add about 1 lb of diced squash and a generous pinch of salt (3). Turn the heat up to medium-high and sauté the squash for about 5 minutes until softened a little. Stir in 1 1/2 cups arborio rice and 2 cloves of thinly sliced garlic (4) and stir until the rice becomes slightly translucent around the edges then add 1/2 cup dry white wine to deglaze the pan (5). Turn the heat back down to medium and add 1/2 cup of the stock. Continue stirring until almost all the liquid has been absorbed then add another 1/2 cup of stock. Continue doing this until the rice is creamy but still has a little bite to it. For me, this almost always takes exactly 25 minutes and as mentioned you probably won’t need all the stock. When the risotto is ready, remove from the heat and stir in one more 1/2 cup of the stock, the zest and juice from a lemon, 1/2 cup grated parmesan cheese and season with salt & pepper (6). Serve immediately with the chunks of crab on top! Start of by cracking your crabs and getting the meat out. Simmer the stock in a pot and keep it near the burner you’ll be making your risotto on (you probably won’t need all of the stock but you always want to have more ready than you’ll need!). Heat up olive oil over medium heat then add onion. Sauté for about 5 minutes until translucent then add squash and a generous pinch of salt. Turn the heat up to medium-high and sauté the squash for about 5 minutes until softened a little. Stir in the rice and the garlic and stir until the rice becomes slightly translucent around the edges then add the wine to deglaze the pan. Turn the heat back down to medium and add 1/2 cup of the stock. Continue stirring until almost all the liquid has been absorbed then add another 1/2 cup of stock. Continue doing this until the rice is creamy but still has a little bite to it. For me, this almost always takes exactly 25 minutes and as mentioned you probably won’t need all the stock. 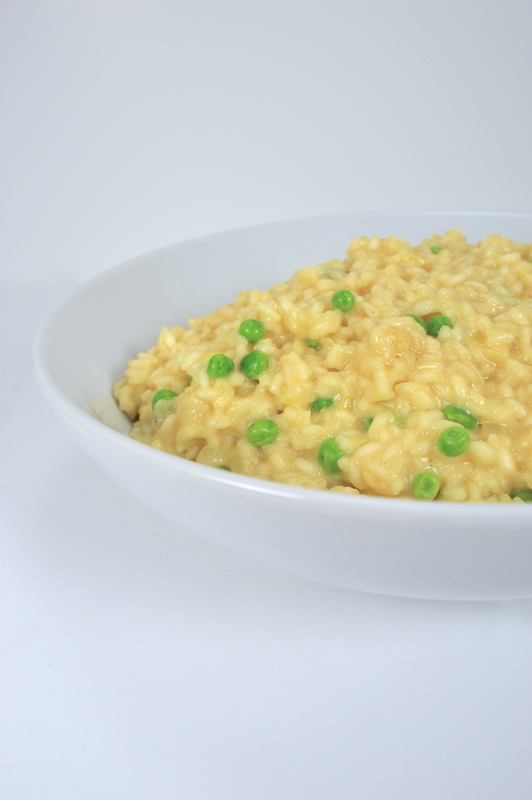 When the risotto is ready, remove from the heat and stir in one more 1/2 cup of the stock, the lemon zest and juice, parmesan cheese and then season with salt and pepper. Serve immediately with the chunks of crab on top! I so want to use this!